It was a cold but dry wintery day when we set off for a walk around Marbury Country Park on the edge of Northwich in Cheshire. This is a fantastic area for a walk with so much variety there is no time to be bored. We started out walking through the woods along the shores of Budworth Mere, spotting the pretty village of Great Budworth across the water. We followed the canal for a short distance to the Lion Salt Works museum before walking back round Neumann’s Flash, stopping to look at the wildfowl and returning by the River Weaver and back to the canal and Big Wood. This is a walk we’ve done before but I never tire of it. Walking around Neumann’s Flash on this grey day I found this memorial bench to David Vodros, a young man who is clearly much loved and missed. Last summer we had a lovely few days camping at the lovely Lamb Cottage Caravan Park, which is truly a tranquil haven in the Cheshire countryside. From the campsite we easily picked up the Whitegates Way, a 10 kms long traffic-free cycle route between Winsford and Cuddington that took us to the many trails in Delamere Forest. We also enjoyed walking from the campsite around the network of paths around the pools and woodland of Newchurch Common, which are a haven for birds. 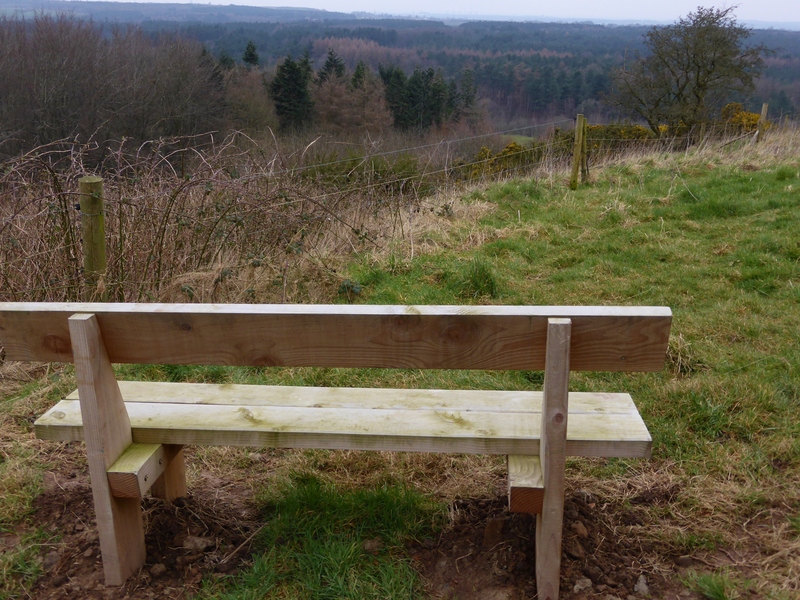 Overlooking one of the pools I found this bench to two friends who walked with the Warrington Ramblers. Both Frank Bishop and Jack D Hanson were members of the Warrington Ramblers and Frank Bishop received a long-standing members award in 2009 at the club’s 60th birthday celebration. Minutes of the group record that Frank Bishop served as a committee member for many years and was a walk leader. In 2010 Warrington Ramblers held a memorial walk for Frank Bishop that was attended by over 50 walkers. I was touched to read about the connection between these two ramblers on this bench. Frank Bishop died more than ten-years after Jack D Hanson and is described as a ‘walking pal of Jack.’ It is entirely fitting that the Warrington Ramblers have remembered both these fellow walkers in a memorial bench that can be enjoyed by other walkers, including me. Mow Cop is a hilltop village on the Staffordshire and Cheshire border and is a great viewpoint. This bench sits on the slopes down to the Cheshire plain and is below Mow Cop’s landmark folly that was built to look like a ruined castle and enhance the view around 250-years ago. The Mow Cop website gives a full and interesting history of the ‘castle’ and of the village and I recommend you take a look before visiting. I haven’t been able to find out what Harry Brookes’ link with Mow Cop was and why his relatives or friends chose this splendid position for a memorial bench to him after his death. Maybe someone out there remembers him. And yet, while his bench remains he isn’t forgotten and I sat taking in the view and thought about the moving quote on this memorial bench to Harry Brookes. The heartfelt sentiment on the bench certainly tells me that he was a man who was very much loved and not forgotten. 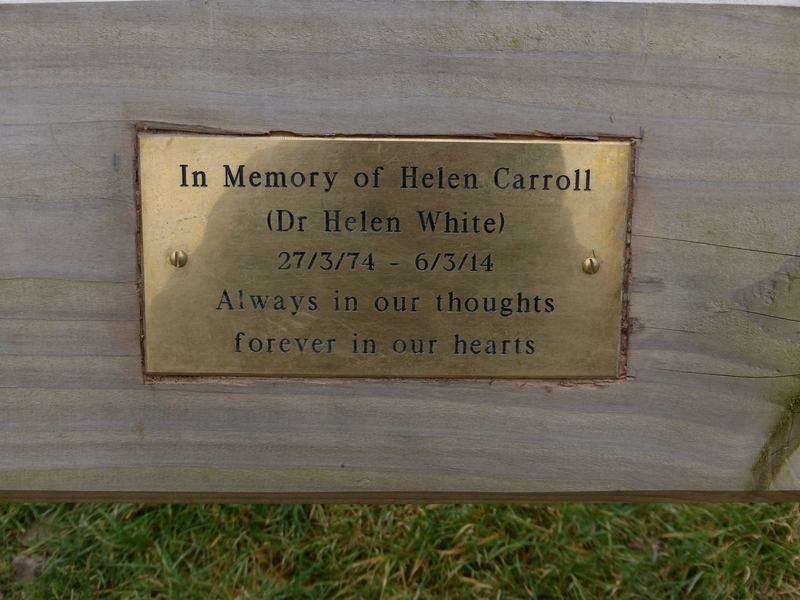 As we walked up the gravel path on the slopes of Old Pale Hill on a recent walk with friends, I found this bench that had clearly been newly erected in memory of Helen Carroll (Dr Helen White). Helen Carroll died at the young age of 39-years after a long illness and the sadness of the families loss and the love for her came through in the simple words on the plaque. Of course, there are literary associations between the name Carroll and Cheshire, as Lewis Carroll was the pen name of Charles Lutwidge Dodgson who was born in nearby Daresbury and this also drew me to the bench. The top of Old Pale Hill, although only 176m high, gives a 360º view over the Cheshire plain to seven counties: Cheshire, Derbyshire, Lancashire, Shropshire, Staffordshire, Denbighshire and Flintshire and at the top is a circle of stones to mark each county. Delamere Forest is a fantastic area of woodland in Cheshire with many trails for walking and mountain biking and is a favourite area for us, being less than an hour drive from Salford. 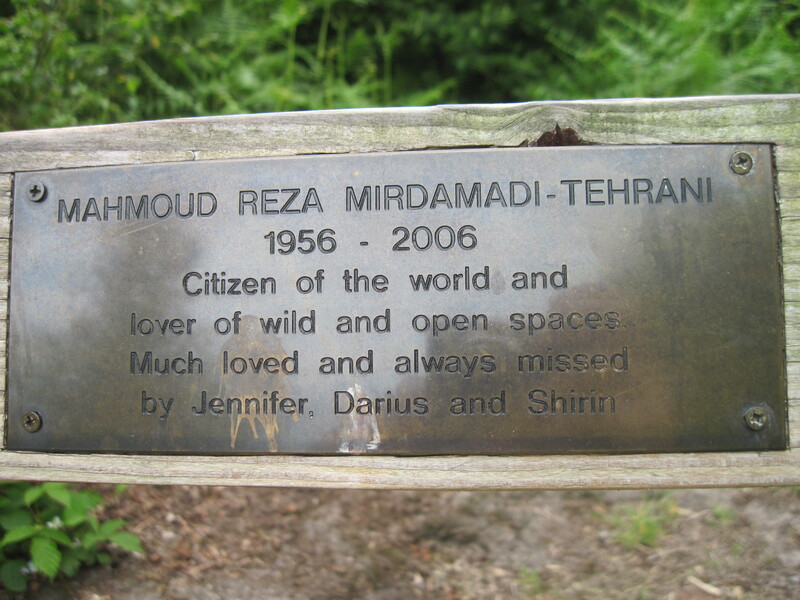 This second memorial bench in Delamere Forest is dedicated to Mahmoud Reza Mirdamadi-Tehrani, who died in 2006. 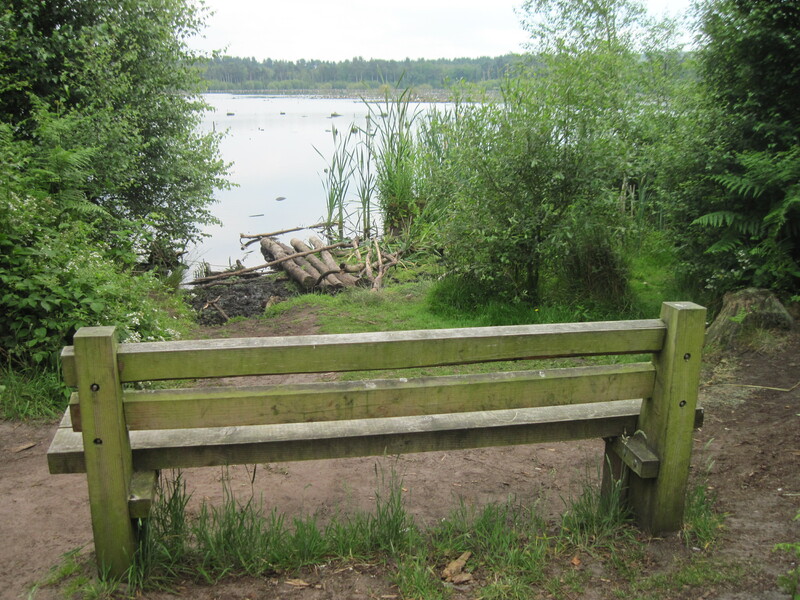 The bench is overlooking Blakemere Moss, which is in the middle of Delamere Forest and was restored as a lake in 1992 by the Forestry Commission, after being drained in the 19th Century. I spent a few days camping near Delamere Forest in the summer of 2010 and this bench was a welcome rest and lunch stop on a day’s cycling in the area.